All transactions are safe and secure with a reliable history in online purchasing behind each of our associates. Buy the Official Red Ryder BB Gun (1938 Model in Retro Box) to own Christmas Story clothing and merchandise. While other kids are excited to get a new sled, a football or in the case of Ralphie's brother, a toy Zeppelin, Ralphie Parker has his sights set on a Red Ryder Carbine-Action Range Model Air Rifle. In other words, he wants a BB Gun. 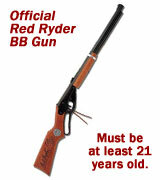 Here's your chance to get the age-appropriate fan in your life an Official Red Ryder BB Gun. Just remind them not to shoot their eye out, or yours. In addition to the Official Red Ryder BB Gun (1938 Model in Retro Box) above, browse the Christmas Story Clothing Gallery for more apparel like men's and women's clothes, kids shirts or hoodies.